"Houston's historically black neighborhoods devastated by flooding, with little safety net" was first published by The Texas Tribune, a nonprofit, nonpartisan media organization that informs Texans — and engages with them — about public policy, politics, government and statewide issues. HOUSTON — Six-year-old Karla Rogers lingered on the sidewalk outside her apartment in the hot sun on Thursday, refusing to go any farther. Her friend had told her there were snakes inside. Five days earlier, her father had lowered her down from a second-story window into the arms of a Houston police officer standing in chest-deep floodwater that had appeared almost overnight with the arrival of what by then had become Tropical Storm Harvey. They returned to their public housing complex Thursday afternoon to meet with a FEMA inspector who would do a walkthrough of the three-bedroom, one-bath dwelling and determine if they qualified for financial assistance that would allow them to get a hotel room. When they arrived, the complex was nearly deserted — a lot of other people had gotten help, Rogers said — and the inspector was running late. They had to walk a mile from the downtown emergency shelter where they had been staying for nearly a week because their Ford Explorer had been flooded out, Rogers said. “So we can’t get in our car no more?” a wide-eyed Karla asked, her cheeks gleaming with tears. When he picked her up to carry her toward the apartment, she burst into tears and began to shriek: “I’m scared; I don’t want to go!” The inspector had just called and would arrive in 15 minutes. The scene at Rogers’ apartment complex was playing out all over Houston's Fifth Ward, which has long been a predominantly black neighborhood. First settled by freed slaves in the mid-1800s, the Fifth Ward and nearby neighborhoods were once thriving communities of railroad and industrial workers in the mid-20th century. But the decline of industry in the neighborhood and a lack of government investment helped contribute to rapid deterioration later on. Not all of the area is known to flood regularly; some newer homes and apartments escaped the waters even during Harvey. FEMA doesn’t consider Rogers’ complex to be in a floodplain even though it backs right up to Buffalo Bayou, a usually slow-moving river that runs through downtown Houston but which swelled to unprecedented levels during the storm. Compared to other parts of town, the safety net for many of these residents is severely lacking. 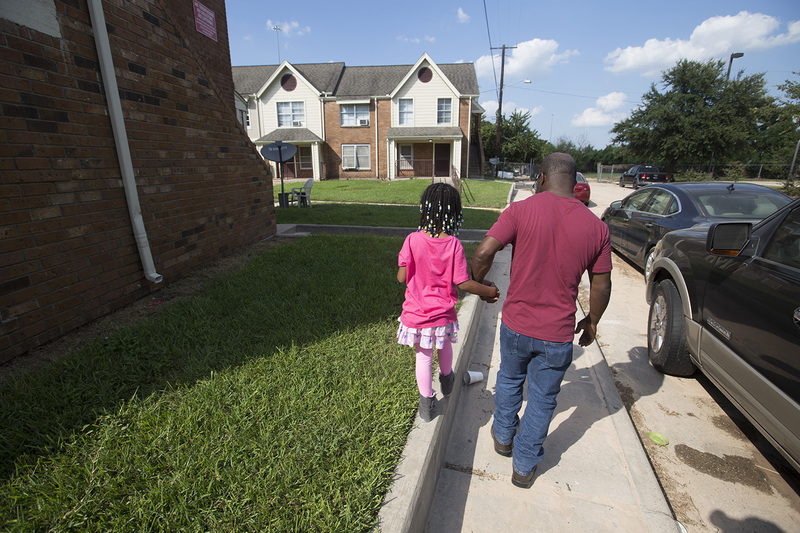 Rogers and his daughter had moved to their public housing complex just two months earlier from a homeless shelter in League City. He had lost his job and his apartment after divorcing Karla’s mother, and he fought a long custody battle to keep his daughter. All over the Fifth Ward, the watermark appeared to be waist-deep in the one-story homes. Yards were full of debris and wet carpet. Many residents who had been flooded out were walking to and from their houses each day to a downtown evacuee shelter — about 4 miles away — to get food and a dry place to sleep. In wealthy neighborhoods, many residents had kayaks and fishing boats to help rescue their neighbors. But that wasn't the case in one apartment complex just north of the Fifth Ward. Water had gotten up to 18-year-old Kisha Adams’ waist in her family’s one-story apartment before she sought refuge in the upstairs unit with neighbors. But the water kept rising. Then, the breaker box across the parking lot of the rundown complex caught fire, and Adams watched the smoke and flames as she called 911. She never got through. Helicopters flew overhead and she tried to wave huge flashlights in their direction, but they never stopped. So Adams, her parents and her 1-year-old daughter waited nervously with no power and spoiling food until the water receded. It took two and half days for them to walk safely downstairs. Just a few doors down, 61-year-old Marilyn Wilson put her head in her hands as neighbors hauled all of her ruined possessions — furniture, clothes, heirlooms, electronics — from her apartment. They wore masks over their faces to protect from a toxic smell that seemed to permeate the area. Wilson has a number of severe health problems, including diabetes and high blood pressure, and she usually gets around in a wheelchair. After the water receded in her home, she returned to discover all her medical equipment was ruined. That includes a machine that helps her with sleep apnea and a hospital-style electric bed that keeps her elevated since she cannot lie flat. She said Medicare will replace the items for free but that she doesn’t know how long that will take. “It was hell. It was hell on earth, I’m telling you,” said Wilson as she recalled the experience. “I wouldn’t wish this on anybody because this is devastating.” A retired cafeteria worker, Wilson takes in just $1,000 a month from a combination of social security and retirement income, more than half of which she spends on rent. Caldwell said Wilson’s story is not an unusual one for the area. Many residents here, including seniors and disabled people, were trapped during the storm and are now facing what seems like an impossible task: rebuilding mostly one-story apartments and finding somewhere else to live in the meantime. They will have to rely on FEMA for aid, and it may take months for that help to come through. 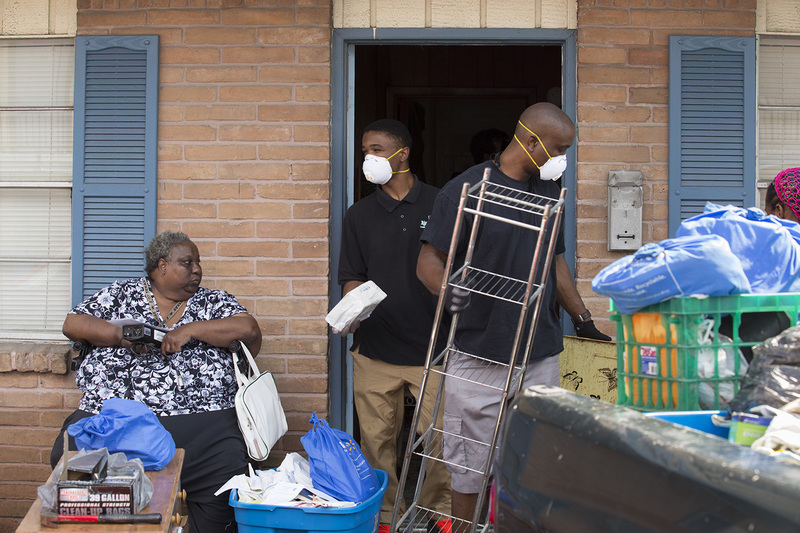 By mid-week, residents across the city were taking first steps in the rebuilding process — ripping out soggy carpet, running big fans to help dry things out — but they appeared much wearier in the Fifth Ward area than wealthier parts of town. Hundreds of families have been displaced from city-owned public housing complexes that flooded in the wake of Harvey, said Brian Gage, a senior policy adviser for the Houston Housing Authority. Rebuilding will be a long and painful process for people with so few resources, he said while standing inside a cavernous hall at the downtown convention center where Rogers and his daughter had been staying. About 90 of the 296 units in Rogers' 1950s-era complex had flooded, according to two maintenance men cruising around the complex in a dirt-crusted golf cart. By Thursday evening, the FEMA inspector had looked at Rogers’ home, and he’d walked with his daughter back to their evacuee shelter. They had hoped that federal aid might come through quickly, but the inspector told him it would be days before they could get back with him. Even though the situation seemed dire, Rogers appeared calm. He was doing everything for Karla. “I’ve got to keep fighting. This is my reason to,” he said, gesturing toward her. Houston's historically black neighborhoods devastated by flooding, with little safety net By Neena Satija, The Texas Tribune and Reveal and Kiah Collier, The Texas Tribune August 31, 2017 HOUSTON — Six-year-old Karla Rogers lingered on the sidewalk outside her apartment in the hot sun on Thursday, refusing to go any farther. Her friend had told her there were snakes inside. Five days earlier, her father had lowered her down from a second-story window into the arms of a Houston police officer standing in chest-deep floodwater that had appeared almost overnight with the arrival of what by then had become Tropical Storm Harvey. “She’s been devastated ever since,” said Eddie Rogers, who is 50. “My main concern was just getting her out.” They returned to their public housing complex Thursday afternoon to meet with a FEMA inspector who would do a walkthrough of the three-bedroom, one-bath dwelling and determine if they qualified for financial assistance that would allow them to get a hotel room. When they arrived, the complex was nearly deserted — a lot of other people had gotten help, Rogers said — and the inspector was running late. They had to walk a mile from the downtown emergency shelter where they had been staying for nearly a week because their Ford Explorer had been flooded out, Rogers said. “So we can’t get in our car no more?” a wide-eyed Karla asked, her cheeks gleaming with tears. “No, baby,” he said. 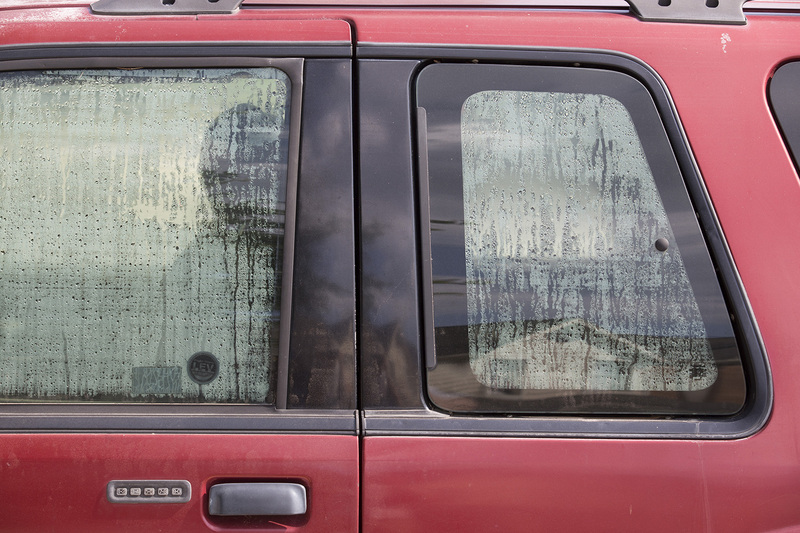 The windows of Eddie Rogers' flooded Ford Explorer steam up on the inside. Michael Stravato for The Texas Tribune When he picked her up to carry her toward the apartment, she burst into tears and began to shriek: “I’m scared; I don’t want to go!” The inspector had just called and would arrive in 15 minutes. The scene at Rogers’ apartment complex was playing out all over Houston's Fifth Ward, which has long been a predominantly black neighborhood. First settled by freed slaves in the mid-1800s, the Fifth Ward and nearby neighborhoods were once thriving communities of railroad and industrial workers in the mid-20th century. But the decline of industry in the neighborhood and a lack of government investment helped contribute to rapid deterioration later on. Not all of the area is known to flood regularly; some newer homes and apartments escaped the waters even during Harvey. FEMA doesn’t consider Rogers’ complex to be in a floodplain even though it backs right up to Buffalo Bayou, a usually slow-moving river that runs through downtown Houston but which swelled to unprecedented levels during the storm. “This was the big one,” said Rev. James Caldwell, a community advocate who grew up in the Fifth Ward and has lived here for the past 20 years. “This is the first time that I’m aware of in years that this area actually flooded into homes. It floods — the streets turn into rivers, and all that — but the homes themselves are generally safe. This time, it hit homes.” Compared to other parts of town, the safety net for many of these residents is severely lacking. Rogers and his daughter had moved to their public housing complex just two months earlier from a homeless shelter in League City. He had lost his job and his apartment after divorcing Karla’s mother, and he fought a long custody battle to keep his daughter. All over the Fifth Ward, the watermark appeared to be waist-deep in the one-story homes. Yards were full of debris and wet carpet. Many residents who had been flooded out were walking to and from their houses each day to a downtown evacuee shelter — about 4 miles away — to get food and a dry place to sleep. In wealthy neighborhoods, many residents had kayaks and fishing boats to help rescue their neighbors. But that wasn't the case in one apartment complex just north of the Fifth Ward. Water had gotten up to 18-year-old Kisha Adams’ waist in her family’s one-story apartment before she sought refuge in the upstairs unit with neighbors. But the water kept rising. Then, the breaker box across the parking lot of the rundown complex caught fire, and Adams watched the smoke and flames as she called 911. She never got through. Helicopters flew overhead and she tried to wave huge flashlights in their direction, but they never stopped. So Adams, her parents and her 1-year-old daughter waited nervously with no power and spoiling food until the water receded. It took two and half days for them to walk safely downstairs. “We lost everything,” said Adams, a native Houstonian. “Everybody lost everything.” Just a few doors down, 61-year-old Marilyn Wilson put her head in her hands as neighbors hauled all of her ruined possessions — furniture, clothes, heirlooms, electronics — from her apartment. They wore masks over their faces to protect from a toxic smell that seemed to permeate the area. Wilson has a number of severe health problems, including diabetes and high blood pressure, and she usually gets around in a wheelchair. After the water receded in her home, she returned to discover all her medical equipment was ruined. That includes a machine that helps her with sleep apnea and a hospital-style electric bed that keeps her elevated since she cannot lie flat. She said Medicare will replace the items for free but that she doesn’t know how long that will take. “It was hell. It was hell on earth, I’m telling you,” said Wilson as she recalled the experience. “I wouldn’t wish this on anybody because this is devastating.” A retired cafeteria worker, Wilson takes in just $1,000 a month from a combination of social security and retirement income, more than half of which she spends on rent. Marilyn Wilson, 61, watches as volunteers Jamal Stenson and his son Aahmad clean her flooded apartment out in the Kashmere Gardens neighborhood of Houston on Thursday, Aug. 31, 2017. Michael Stravato for The Texas Tribune Caldwell said Wilson’s story is not an unusual one for the area. Many residents here, including seniors and disabled people, were trapped during the storm and are now facing what seems like an impossible task: rebuilding mostly one-story apartments and finding somewhere else to live in the meantime. They will have to rely on FEMA for aid, and it may take months for that help to come through. By mid-week, residents across the city were taking first steps in the rebuilding process — ripping out soggy carpet, running big fans to help dry things out — but they appeared much wearier in the Fifth Ward area than wealthier parts of town. Hundreds of families have been displaced from city-owned public housing complexes that flooded in the wake of Harvey, said Brian Gage, a senior policy adviser for the Houston Housing Authority. Rebuilding will be a long and painful process for people with so few resources, he said while standing inside a cavernous hall at the downtown convention center where Rogers and his daughter had been staying. About 90 of the 296 units in Rogers' 1950s-era complex had flooded, according to two maintenance men cruising around the complex in a dirt-crusted golf cart. By Thursday evening, the FEMA inspector had looked at Rogers’ home, and he’d walked with his daughter back to their evacuee shelter. They had hoped that federal aid might come through quickly, but the inspector told him it would be days before they could get back with him. Even though the situation seemed dire, Rogers appeared calm. He was doing everything for Karla. “I’ve got to keep fighting. This is my reason to,” he said, gesturing toward her. Eddie Rogers and his daughter Karla outside their Houston apartment on Thursday, Aug. 31, 2017. Michael Stravato for The Texas Tribune Read related Tribune coverage Railroad Commissioner Ryan Sitton: There is no fuel shortage Beaumont loses water supply after flooding from Harvey It’s been one week since Harvey hit Texas. Here’s what you need to know. "Houston's historically black neighborhoods devastated by flooding, with little safety net" was first published at by The Texas Tribune, a nonprofit, nonpartisan media organization that informs Texans — and engages with them — about public policy, politics, government and statewide issues. Link back to the original article, which is located at https://www.texastribune.org/2017/08/31/devastation-houstons-fifth-ward-and-trouble-rebuilding/.